GPTBee is a trusted GPT (Get Paid To) site existing since 2014 and that allows you to earn a lot of money in a short time. The principle on GPTBee is to complete a maximum of offers and/or surveys to earn maximum money per day. In addition, unlike other GPTs that wait weeks or even months to validate your earnings, GPTBee validates offers in 1 to 2 minutes maximum. 90% of the time, these offers are even validated automatically in 30 seconds maximum. Offers available directly on GPTBee : these offers are better paid and validated almost instantly (in 30 seconds max). Offers available through offerwalls : currently, there are 18 offerwalls. Note that available offers are subject to change over time. 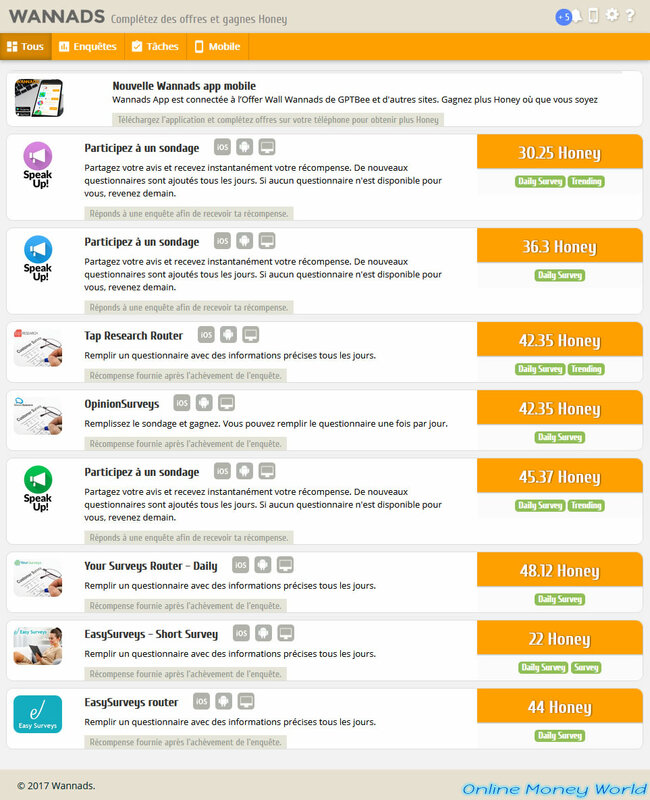 First, in the "Earn -> Daily Surveys" menu of GPTBee, you'll find daily surveys from different providers. Each of these surveys will be paid between 39 honey ($ 0.39) and 65 honey ($ 0.65). Since these are daily surveys, you can only complete one survey per offer (provider) per 24 hours. The "24 hours" mention is important because it means that if you complete a survey at 15h, you can't complete another survey via this provider before the next day 15h. Nevertheless, these surveys are very well paid and already allow you to quickly earn a few dollars in one day. Currently, you will find 5 daily surveys offers provided by 2 providers : Your-Surveys and PeanutLabs. Which means that you will be able to complete 5 daily surveys per 24h thanks to these 5 offers. For PeanutLabs, GPTBee only offers the classic "router" to complete one of the surveys offered by PeanutLabs. Once completed, click on Submit and you will be credited with 52 honey within one minute. Nevertheless, by testing them, you will see that they are not all managed by the same site. 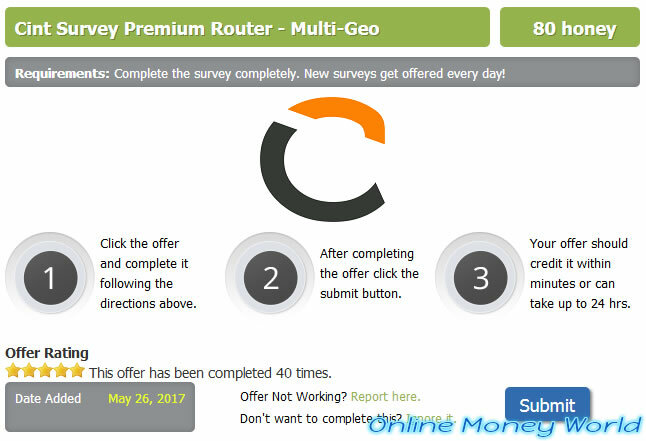 Indeed, for the "Your-Surveys ... - Global" and "Your-Surveys ... - Worldwide" offers, you will arrive directly at Your-Surveys. To be able to propose surveys, Your-Surveys will have to know you. To do this, enter an e-mail address and click on "Continue". It's important to indicate the same e-mail address per offer (provider) each time so that the site (Your-Surveys in this case) can recognize you next time. Indeed, the more surveys you complete, the more you will have access to future surveys. PS : Your-Surveys will never send you mails to this address. 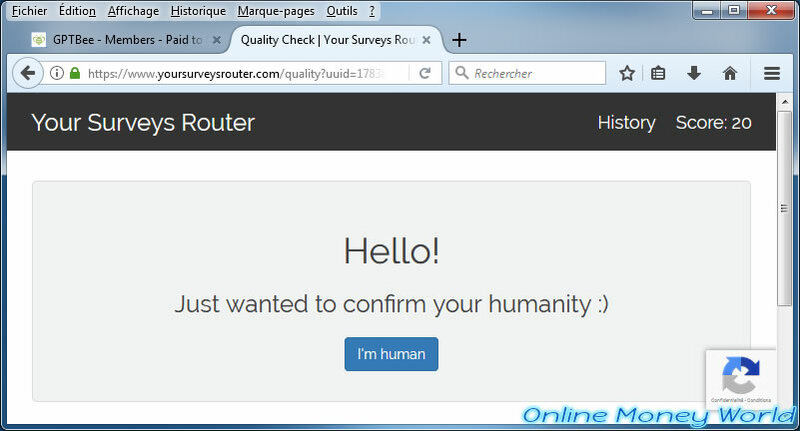 Since this is the first time you will use this provider, Your-Surveys will ask you some questions about you. These are just basic questions to classify your data in their global statistics. Once the profile is complete, the site will search for a survey for you. 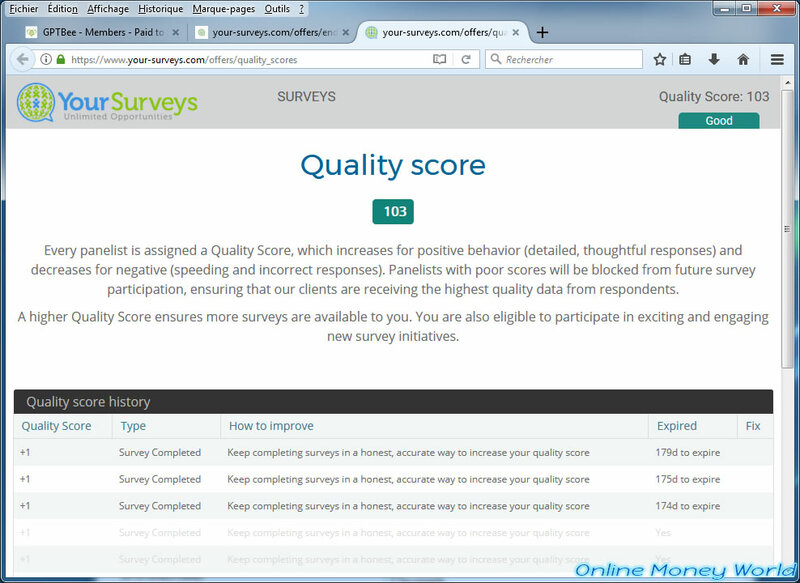 If Your-Surveys finds a survey adapted to your profile, you will be redirected to the survey. Today, Your-Surveys redirected us to a cigarette survey provided by Ipsos (the marketing research company that created the i-Say surveys site). PS : if for some reason or other, the site excludes you from the survey, you will be automatically redirected to another survey. 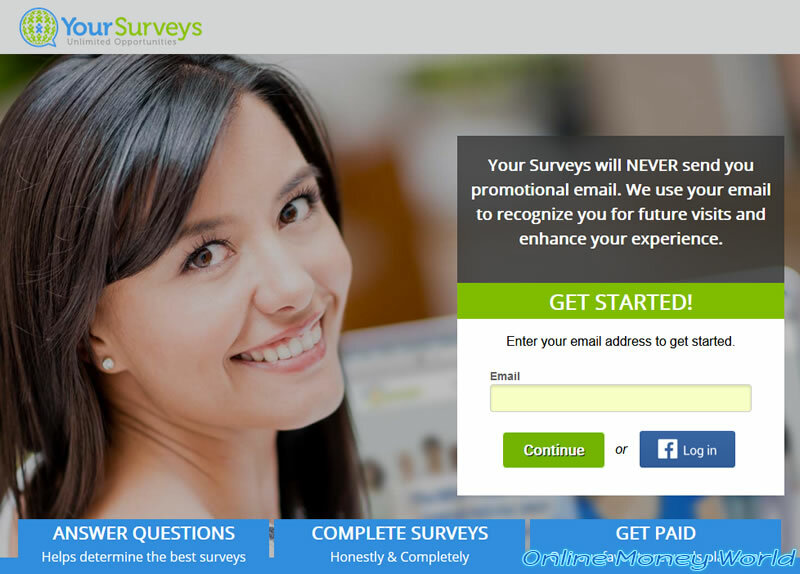 Once the survey is complete, you will be automatically redirected to Your-Surveys. 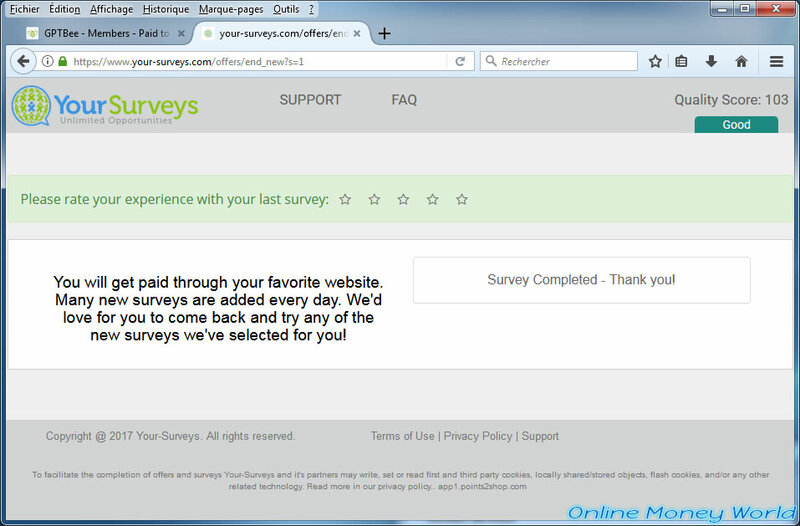 As indicated by Your-Surveys, you have completed the survey and you will be paid through your favorite site. In this case, GPTBee. By thoroughly completing surveys every day at Your-Surveys, you will improve your reputation at Your-Surveys and you will have access to more surveys. Indeed, if you click on your score displayed on the top right, you will see that you earn 1 point per survey completed seriously at Your-Surveys. By improving your score, you will have access to more surveys. 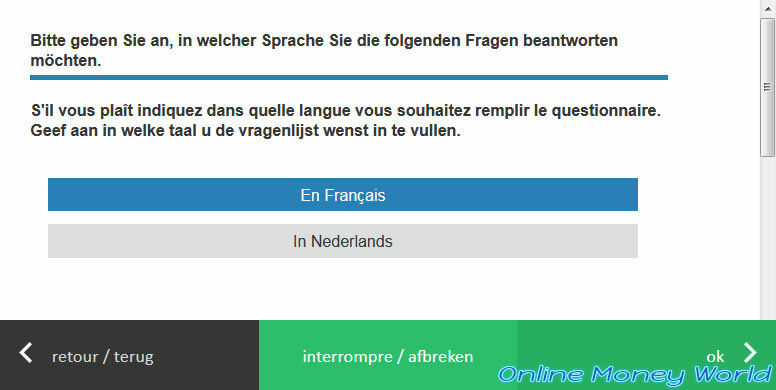 On the other hand, if you give wrong answers and/or hurry to answer their surveys, your score will decrease and you will not be able to answer their surveys. So, always read the questions asked in their surveys. Note : the score is calculated over the last 6 months (180 days) starting today. It's therefore necessary to remain active so that your score doesn't fall back to the basic score (100 points). Click Submit at GPTBee to indicate that you have completed this offer. PS : it's possible that the offer is validated automatically. In this case, GPTBee will tell you that you have already submitted this offer. Wait 1 to 2 minutes, then go to your GPTBee account history. Since the offer is paid in honey, you must go to the menu : Account -> Balance History. Then, click on "View History" to the left of your "Honey Balance". As you can see, this "Your-Surveys Unlimited Survey Router - Global" offer has been paid 65 honey. For "Your-Surveys ... - Express" and "Your-Surveys ... - Quick" offers, you will be redirected to a site posing as Your-Surveys. But, this is an intermediary. Indeed, the domain name is slightly different and this site will ask you to indicate an e-mail address to recognize you, but also to activate your "account" with them. 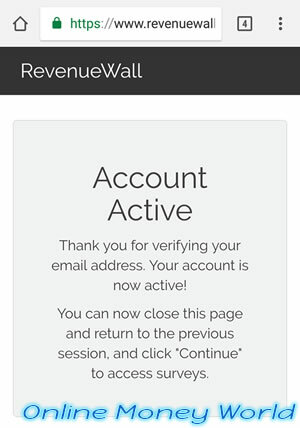 Once you have entered your email address, you will receive an activation email from RevenueWall. So, it's necessary to indicate an e-mail address which really exists. When you click on the link received by email, you will come to a page similar to this. 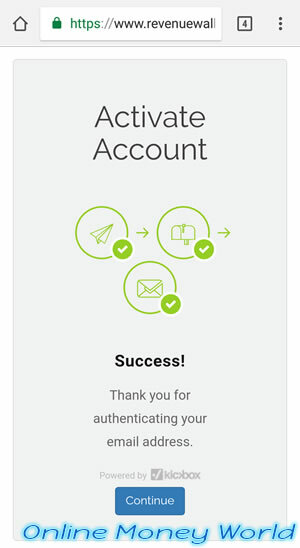 Then, on the other page that remained open, you will see that your account has been activated. Click on the "Continue" button to access a Your-Surveys survey. On GPTBee, you will also find unlimited survey offers. This means that you will be able to complete a maximum number of surveys per day at the same provider. Which is not possible for the daily surveys of the "Daily Surveys" section. To access these unlimited daily surveys, go to the "Earn -> Daily Surveys" menu of GPTBee, then click on the "UNLIMITED SURVEYS" link that you will see at the beginning of the page. 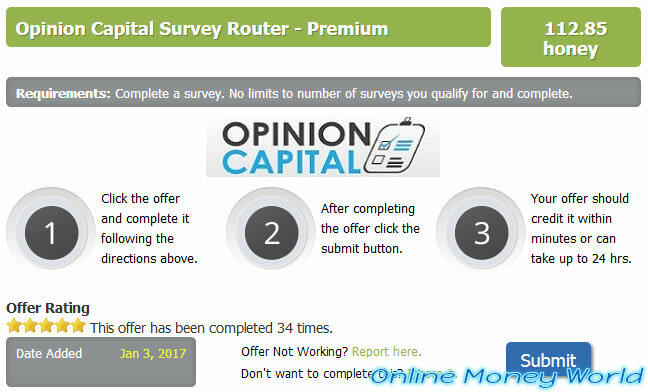 In this section, you will find these 2 surveys providers : CINT and Opinion Capital. Among the offers offered by GPTBee, you will also find paid registrations. These are paid in honey or dollars. But in both cases, it will allow you to earn money because the points can be converted into dollars and vice versa. Note : if you wish, you can also add your own paid registrations to get referrals on different paid sites. Currently, GPTBee offers 18 offerwalls including : PTCWall, WannAds, Personaly and MinuteStaff. In all these offerwalls, you will find many paid offers, including surveys, paid registrations and mobile applications (Android and iOS). 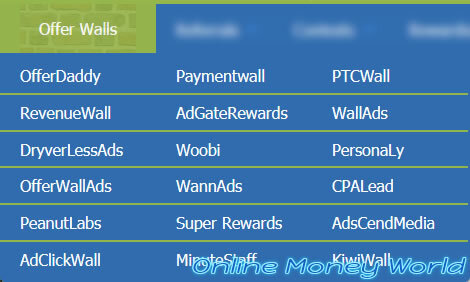 These providers are available in most offerwalls, and especially in the WANNADS offerwall which is the best offerwall for completing surveys. Indeed, this offerwall offers almost all existing providers on the web. 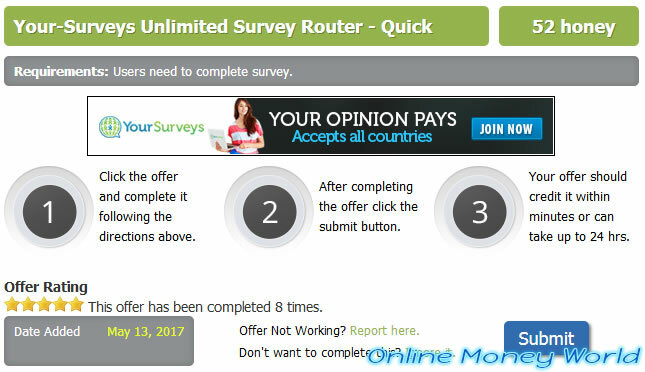 If you go in the "Surveys" tab of this offerwall, you will also find from time to time additional surveys provided, for example, by FSurvey and PnSurvey. For SSI (Survey Sampling International LLC), you will find it at TokenAds (Woobi). In the Personaly offerwall, you will find the SpeakUp provider and occasionally additional surveys. In most offerwalls, you will also find paid registrations (PTS) for various sites, as well as competitions to win a car (a Mini, a Mercedes, ...). Finally, you will also find mobile applications for Android and/or iOS (Apple). 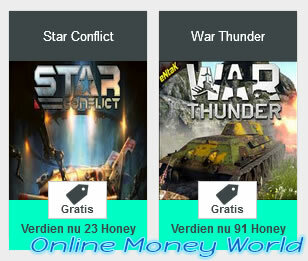 Just download and install the available mobile apps to earn honey. Important : don't install all available applications on your smartphone, because some of these applications may be infected with a virus. It all depends on the application proposed. In addition, this type of offer is not always credited (whatever the GPT where you are registered).